A subtle breeze and pristine blue sky set a peaceful scene in the Hill District this morning, so the immediate thought might not be on the dozens of young men killed in the span of only a few blocks. It’s almost always guns. Often stolen, or obtained through a straw purchase, then used against a teenager or young adult. In this neighborhood, in Homewood, Larimer, East Liberty, and across the Allegheny and Monongahela in areas where bursts of gunfire – and stolen weapons – are not rare. Pittsburgh Mayor Bill Peduto calls these preventable deaths. He’s brief. It’s a speech he’s given before, noting the pain to families and the inevitable question of why more isn’t done to change things. “The resounding echo that we hear back is, ‘No, there’s nothing that we can do about it,’” he said at a sparsely attended press event organized by CeaseFirePA. The mayor is referencing inaction on safer gun laws in Washington, D.C., and also in Harrisburg, where a bill has reemerged that would give groups like the NRA stronger standing to sue Pittsburgh and other municipalities trying to reduce the prevalence of illegal guns. In 2008, city council passed an ordinance requiring residents to report to police when guns had been lost or stolen. That same year, about 80 percent of guns recovered by city police were owned by someone other than the perpetrator, according to a new study by researchers at the University of Pittsburgh. The National Rifle Association and a group of members sued Pittsburgh over the ordinance, claiming the city had no authority over guns. But the suit stalled after a judge ruled the NRA hadn’t shown that its members had been harmed. So, in 2014, state law was changed to allow organizations like the NRA to sue without first being required to show that members suffered any harm. The NRA did just that, filing suit against Pittsburgh, Philadelphia and Lancaster. That law was scrapped by the state Supreme Court in June. It was ruled unconstitutional because it was attached to a law about penalties for scrap metal theft, rather than as part of a standalone bill. Now a bill with nearly identical language is moving forward in Harrisburg. Tim Stevens, founder of the Black Political Empowerment Project, called it “illogical and immoral.” He works closely with mothers who have lost sons and sees the strings of violence constantly catalogued on TV and in newspapers. Yet supporters see the bill as a weapon against government overreach. Rep. Mark Keller, R-Perry/Cumberland, who sponsored the House version, said local rules are confusing for gun owners. He thinks it’s unreasonable for residents to memorize “every firearm ordinance as they pass through each local jurisdiction,” according to a memo attached to the bill. State law prohibits those ordinances at the local level, the memo said. Keller did not respond Thursday to a request for comment. 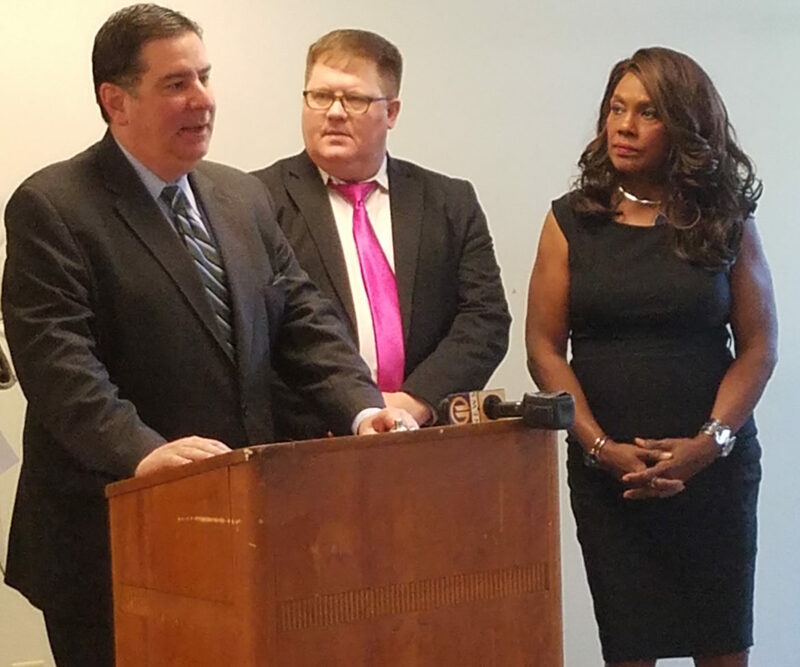 When the NRA lawsuit was active, Peduto explained that the city ordinance actually isn’t stopping anyone from lawfully owning a gun. It just requires lost or stolen firearms to be reported. Rob Conroy, CeaseFirePA’s director of organizing, blames lawmakers for doing almost nothing to stop gun deaths. Rather, he says they’re trying to give the gun lobby unprecedented power in court to challenge laws intended to reduce killings. “We need anything else other than bending over backwards for the gun lobby in such a dramatic way that it fundamentally undermines what our society is all about,” Conroy said at the event. Guns were used in about 88 percent of murders in Pittsburgh from 2010 to 2015. Sunday is the National Day of Remembrance for Murder Victims. Congress created that in 2007.